Did you miss out on backing Into the Black: Boarding Party on Kickstarter? Never fear! We have opened up Late Backing through Pledgemanager! 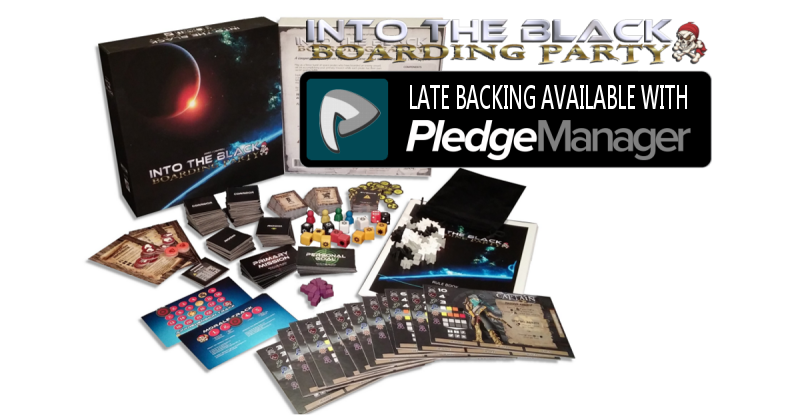 Preorder your copy of Into the Black: Boarding party and the two expansions, “Increased Crew (5-6 Player Expansion)” and “EPIC Encounters” for the same Kickstarter backer bargain price only until June 29th. Once we hit that go-go button with our manufacturer this deal will disappear! 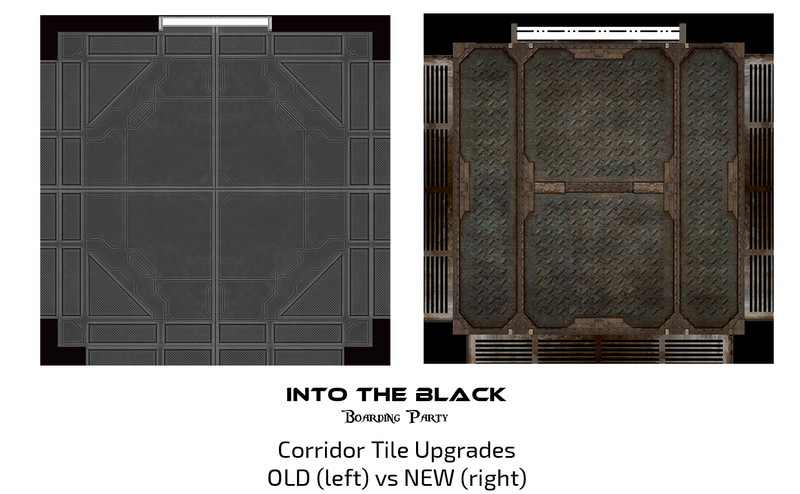 Into the Black: Boarding Party is a 1-4 player (5-6 with Expansion) semi-cooperative Space Pirate “dungeon” crawl with a traitor element that was successfully funded through Kickstarter on March 30th by 426 enthusiastic backers! Quick Player Turns – With 2 actions per turn it will be your turn again in no time! Re-playable – 10+ player boards,14 personal goals, 7 primary missions and a completely modular game board mean no two games are likely to be quite the same! Semi Cooperative – Players must work together to complete the primary mission while also dealing with their own personal goal, complete with the possibility of a traitor in your midst! 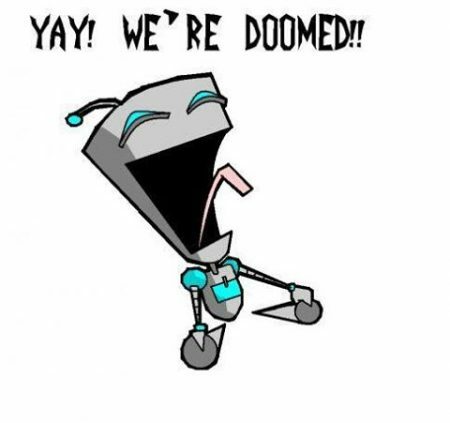 No Player Elimination – Everyone is in the game to the end! 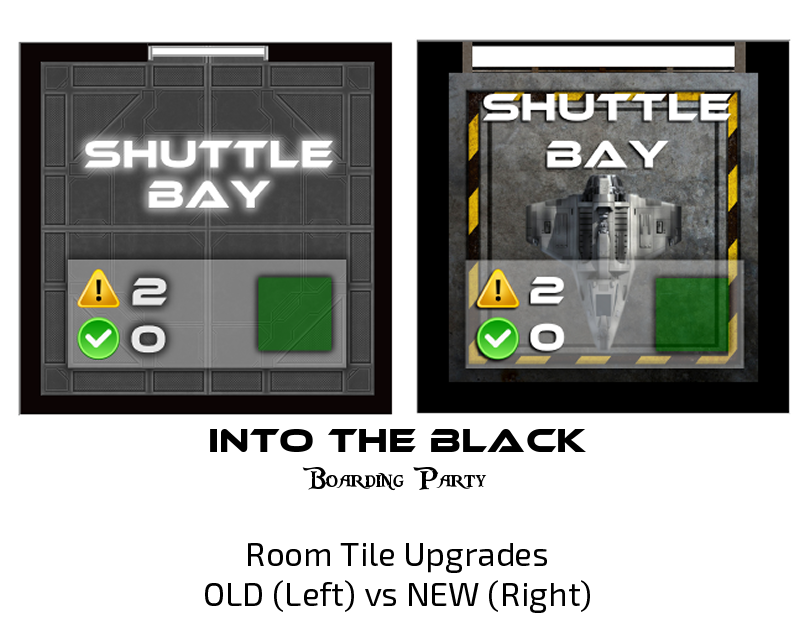 Solo Play Integrated – With a complete enemy AI system, Into the Black: Boarding Party is fully playable solo, by design! 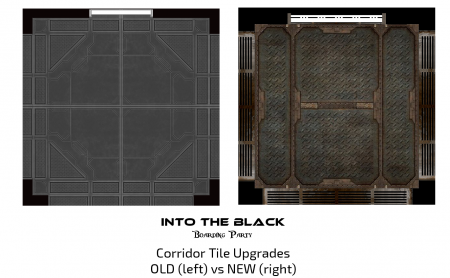 Into the Black: Boarding Party Campaign Ends at 300% Funding! 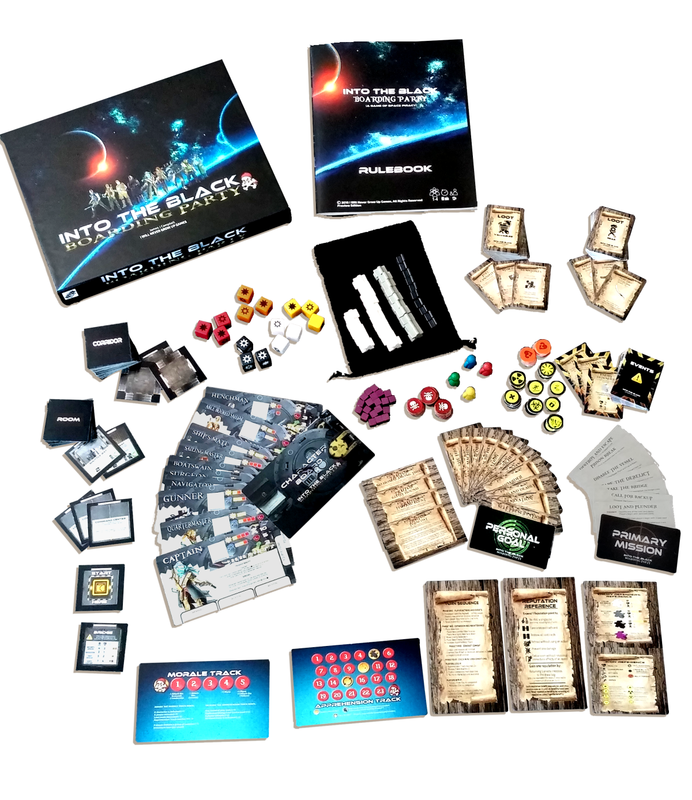 Into the Black: Boarding Party, the space pirate “dungeon” crawl board game from our very own James J Campbell of I Will Never Grow Up Games has successfully funded on Kickstarter! Now the long journey to reality truly begins! With the support of 426 Backers, just like you, we hit nearly 300% funded and 18 STRETCH GOALS unlocked! WOW! Unlocked : Card stock and linen finish upgrade, Player board upgrade, 4 additional (KS Promo) player boards, Custom Shaped Meeples, Standees, Coop scenario “Infestation”, Spot UV Box art, Alternate Bridge tile (KS promo), 2 Expansion add-ons, Increased event card size, plastic insert, More loot cards, and More event cards! I would like to thank everyone for your generous support and all of the positive comments! It means the world to all of us here at I Will Never Grow Up Games! We will be contacting those who have pledge for the special pledge levels that require names, pictures or anything else soon to get those details hammered out. And now, the hard work of updating the files with all of the great unlocked content, implementing some of the awesome backer suggestions, doing the back and forth dance with the manufacturers and then the long .. oh so long .. wait for fulfillment! I cannot wait to keep everyone updated with what’s happening behind the scenes and letting you all know where the project stands as we reach various milestones along the way. Once again, THANK YOU SO MUCH for your support, and to all of our play testers, supporters, fans and everyone else who have supported us over the past nearly 3 years since Into the Black began! Hit Or Miss Dice Now Available from I Will Never Grow Up Games! I Will Never Grow Up “HIT OR MISS” Dice are designed for use with any game that requires rolling any number or more/less! 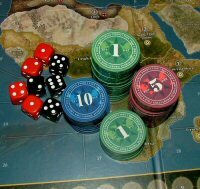 Miniature Wargames, Historical Wargames and more can benefit from these dice! Designed with an increasing threat level color code (White -> Yellow -> Orange -> Red -> Black) to represent the added chances of rolling a hit as you move up the threat level! Do you need to roll a combat that includes 2 units that hit on 2 or higher, 3 hit on 4 or higher and 1 hits on 5 or higher? Sure, you could roll all three of those types of units separately, but with the “Hit or Miss” Dice you can just grab the appropriate number and color of dice and roll it all at once. Then, just add up the hit symbols and you’re done! Speed up your games with I Will Never Grow Up “Hit Or Miss” Dice! Going on the Road – Kind of! 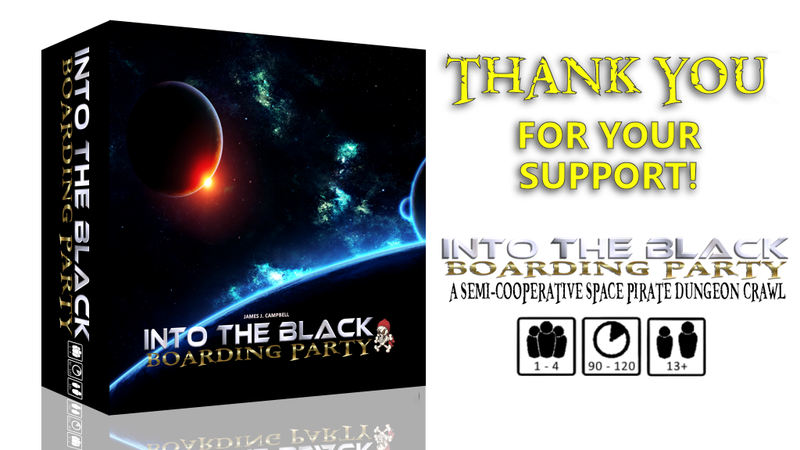 Well it looks like I Will Never Grow Up Games and Into the Black: Boarding Party are going on the road .. in a sense! March 10-12, 2017 we will be attending Breakout Con at the Toronto-Yorkdale Holiday Inn, just a short jaunt down the highway here in Toronto, Ontario, Canada! We’re booking a table in one of the two exhibitor rooms (which table we won’t know until we get there unfortunately) and will have a ton of our luxury gaming accessories available to purchase as well as a copy of Into the Black: Boarding Party to demo/preview for you. Exciting and terrifying all at once! In addition, we MAY just have a couple other games that are being worked on currently hanging around to check out, and our friends will be in the main gaming hall with a second copy of Into the Black available to check out! If you’re in the area and looking for a fun weekend of gaming, come to Breakout Con and while you’re there, please do stop by and say hi! As always, any comments and suggestions are welcome! The premise of this rule is that when you reach 15 (actual number pending a bit more testing) on the Apprehension Track (which, as we all know by now, if it reaches 25 you lose the game), “All is Lost!” is triggered (and a handy reminder will be placed on the Apprehension Track so you don’t forget, of course). At this point, players may vote to replace their current primary mission with a new (randomly drawn) mission and choose one of them to complete. Any vote to replace the mission must be unanimous. If the players vote to replace the mission, immediately reduce morale by 2 and everyone loses one reputation, then draw a new mission. Perhaps replace is not the best wording though? Supplemental mission. Additional mission? In any case, you now have two missions and two paths to win the game, but your time is cut drastically! The goal of this tweak is to give players hope of completing their primary mission in the chance that their current one becomes impossible through any acts of extreme misfortune, or to perhaps draw a simpler mission (or even one that everyone has already completed – luck of the draw can win the day). We’re going to have to test this out and see how it works! 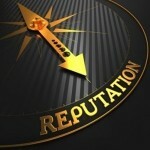 Earning and Expending your Reputation! A space pirates reputation is ever so important. It must be earned, and it can be used to influence the outcome of any number of situations the pirate may find himself in. In Into the Black, each player character has reputation that they may earn and spend. Through continued play testing, it has been found that the current reputation system is overpowered. Having a maximum of 6 reputation points (4 to begin the game) and the ability to earn 1 for each successful combat situation and expend 1 or 2 for any variety of outcomes without limits (beyond the amount of reputation available) is too much and the pool of reputation available has been near endless. Each player begins with 2 reputation points out of a maximum of 5. In order to track what benefits have been utilized, reputation cubes will shift from the reputation track on your player board to the benefit track on your player board. This has the added bonus of providing a visual reminder of what each reputation benefit is as well, rather than referencing the rules or a quick reference card. We’ll see how this works! As always, any comments and suggestions are welcome! several projects such as TechMage Sci-Fantasy RPG, Into the Black: A Game of Space Piracy and Conflict & Chaos: Vietnam 1965. Though the Kickstarter may have flopped, I got a lot of fantastic feedback from backers and play testers than has been going into the updated design of #IntoTheBlack. The core of the game remains the same, but the evolution has brought us into territory that I never would have imagined when I first started building this little universe. A year in the making and still going; Expect the relaunch of the Kickstarter in the new year! Additional Scenarios and Primary Objectives! One of the little nagging things that bothered me all along, starting with day one, was the single, lonely primary objective. While it certainly made the game easier to balance and quicker to learn it left something to be desired. With backer feedback and a little help from some friends several new scenarios have been added to the game and are currently going through play testing! What does this mean for players? Instead of a simple “Find and take over the bridge” scenario to win you will now have to select (at random) a scenario from a deck of cards for the game. Some are easy, some .. well not so easy (heck, downright nightmarish in some cases). Along with your personal objectives to complete there is now a whole lot more to deal with than ever. Dice are great, but custom dice are better! Moving on from a simple x+ roll system the games dice system has evolved into one involving several custom dice. Each players’ character has a different set of dice to use for their actions; some better than others! Of course, you still get the opportunity to manipulate the rolls throughout the game via special abilities, upgrade loot cards and special events. While not necessary, there has been a slight name change. This will help bring Into the Black into the universe that is being created in a better manner. 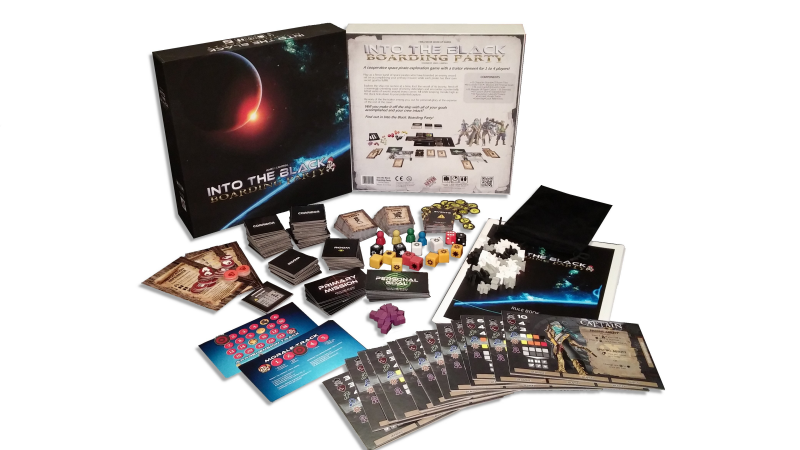 “Into the Black: Boarding Party (A Game of Space Piracy)” – a little long, but the game of space piracy is the common theme throughout the series. Yes, that’s right; this is a series of games, not a single one-off! More on that another time, I promise!